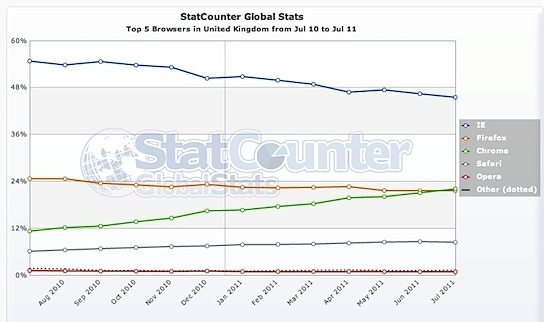 Chrome overtook Firefox as Britain's second most popular browser in July, with almost one in four users preferring the Google product. Figures from web metrics outfit Statcounter show Chrome has reached 22.12 per cent market share, overtaking Mozilla Firefox at 21.65 per cent, and doubling its share over 12 months. Good reviews for Microsoft's IE9 failed to stop the slide, with 45.5 per cent using it, down almost 10 per cent year on year. And Opera's "browser ballot" campaign hasn't won it an advantage; it has slipped from 1.22 to 0.89 per cent share over the year. Safari rose slightly to 8.5 per cent. Since December 2009, Chrome has been heavily promoted by Google in the UK, starting with billboard and newspaper advertising, and TV campaigns this year – Google's first ever UK TV campaign. There may be a marketing lesson here. Chrome's three chief rivals are all more sophisticated products. Each maintains its own rendering engine, while Google like Apple uses Webkit. They're all more mature, too. But Mozilla alone stresses its built-in moral superiority. "Every browser does fast – but not every browser does good," reads one Mozilla billboard, we noticed. But as Matt Asay wrote here, guilt-tripping the public is quite a limited approach. Meanwhile the Chrome TV ads simply crank up the emotional manipulation. They're schmaltzy – pass the sickbag – and even a little bit creepy, a reminder of how Google watches over your most intimate family moments, from the cradle to the grave. But they seem to be working.